Louis is the keyboard virtuoso of Coup de Grace, another Jimmero Studio Artist. He wanted to do a solo collection of his material and asked me to perform and produce his demo. Louis is currently in Boston, studying at Berkley. 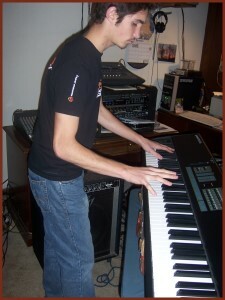 Louis also is one of our friends that come to the ROCK CAMP to give keyboard seminars. It is truly a pleasure to feature him as a Jimmero Studio Artist.